Analysis of Irish genealogies via examination of naming patterns is a proven and recognized practice. Persistence of certain favored family names generation to generation also has recognition as a means of evaluating common ancestry and collateral bloodlines. Given name preferences show up in different ways within many Irish and Norman-Irish from the earliest period. This investigation will attempt to use these methods in treating an aspect of Ferriter Family history. One of the mysteries in the Ferriter Family’s history involves the nature of the relationship between Lucas na Srianta (Luke of the Bridles), and Piaras Feiritear (1), hero, poet, and by oral tradition, Lucas’ grandfather. There are no known direct documentary connections between these men, yet that this relationship existed has persisted as an oral tradition for many generations. The given name Maurice has been long associated with all of the various branches of the FitzGerald family, (Kildare, Desmond, Lixnaw, the Knights, and all cadet lines). Maurice was not frequently used in other Irish or many other Hiberno-Norman families during the first few centuries following the Norman incursion in 1170/72 (2). Within the le Fureter (Ferriter) Family in Kerry the earliest names on record are: Walter, Simon, Martin, Phillip, John and Richard. Later in the medieval period we see Nicholas, Thomas, and William. Nicholas has repetitive usage during the late 14th century through the 15th century. It is during the late 1500’s that the name Maurice first appears within the documentary record associated with the Ferriter Family. The first recorded Maurice Ferriter was Piaras Feiritear’s grandfather (3). That a close relationship existed between the Ferriter Family and the FitzGeralds of Ossurys cantred in Corca Dhubhine, (the family of the Knight of Kerry) is clear. Both families held lands of the Earl of Desmond, and these lands shared common boundaries in Ossurys. Ferriter’s Castle in Ballysibble and the Knight’s stronghold at Rahinane near Ventry are an easy ride from one another, and these castles, taken with the additional FitzGerald tower house at Gallerus form a strong triangular defensive position across the end of the peninsula. The significant evidentiary artifact to be taken from this table is the shift in names occurring pursuant to sustained close association with the Kerry FitzGeralds. Given no other evidences (geographical proximity, political affiliation, intermarriage), this data alone supports a familial connection beginning during the late 14th century. 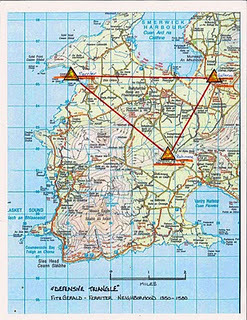 These correspondences began during the late 14th century, coeval with the arrival of the Knight of Kerry in Ossurys and extended until the time of Piaras’ father Eamon. One may also conjecture that Maurice’s mother was of the Knight’s extended family, which would account for the introduction of the forename Maurice at that time. All of this data taken together illuminates the likely social and familial bonds connecting these two families at the onset of the Elizabethan era, as well as highlighting the early significance of the name Maurice, when introduced into the Ferriter lineage. This man may have been Piaras Feiritear’s son. This second Maurice would have been born during the War of the Catholic Confederacy, during the quiet period in West Kerry that followed the siege of Tralee (1642) and that persisted until the arrival in the region of Cromwell’s armies (1651) (6). Piaras was in Kerry and available for a second marriage at this time, given the death of his first wife early in the 1640s. Taking a second wife upon the death of a first was common practice at this time (7). Would Piaras have been likely to have had a second marriage? Certainly. Would Piaras have been likely to have had a son born into a second marriage. Certainly. Would Piaras have been likely to have named a son born into a second marriage Maurice, as his grandfather had been named? Certainly. For Piaras, connecting his family to the pre-Elizabethan Irish past – the past of his grandfather’s time and earlier – may have been important. Certainly we can see in his poetry an understanding of that lost era, and sadness in its passing. (8) The Norman name Maurice would have been rich with personal and historical meaning for Piaras. This name was seemingly likely to have been chosen by Piaras, and may be regarded as a supporting argument in any discussion of the lineage of Maurice of Ballynehigg, and consequently that of Lucais na Srianta. Maurice did not choose conversion or assimilation. Perhaps with less to lose in the material sense, but certainly acknowledging the sacrifice of any possible material or social gain, he held to his faith, and to his Irishness. Maurice was attainted for “foreign treason’ following the Jacobite wars, and no record has been found suggesting that he was later pardoned or restored to good standing. Maurice was outlawed. Outlawry at the time was a tool to force enemies of the crown into a “non-person” status. An individual, once outlawed, had no legal status or protection. Using onomastic information taken solely from the Padraig Feiritear oral genealogy, we find that by the fourth generation following these two Maurices, the name had been used at least seventeen times in individual lines of descent in Ireland. Additional Maurice Ferriters are found in U.S. Ferriter families of the period. The persistence and proliferation of this name in such a way, during the darkest years of the Penal Laws and the advent of famine times is astonishing. To this day, Maurice, the Irish Muiris, and the modern spelling variants Morris and Morrice remain alive and actively used in Ferriter lineages. Was Maurice Ferriter Piaras Feiritear’s son? Was Lucais na Srianta Maurice Ferriter’s son? As stated, at present we have absolutely no documentary proof in answer to either of these two things. When illuminating a history with scant direct documentation, every element of the surrounding historical context – every evidentiary artifact – must be examined for connections and insight. As detailed within this essay, significant evidence exists supporting a positive answer to both the questions posed above. In shaping an affirmative response to either of the questions, the name Maurice emerges as a meaningful common element. (1) That Piaras Feiritear had at least two sons and a daughter is not disputed. These sons were born early enough such that both fought during the War of the Irish Confederacy (War Against Parliament) and both are known to have taken exile to fight on in Europe after the fall of Ross Castle in 1652. The eldest of these sons, Dominick, bears a given name not seen in any early documented reference involving Ferriters, but the name Dominick is known to have been used as a forename within the Trant family. Certain evidences exist that suggest Dominick’s mother was a Trant. There may also be a connection with the Dominican Order, active in Ireland and Spain in educating Irish Catholics during this period. The forename Dominick persisted in use within the Ferriter Family for three generations, while the name Pierce, (Piaras, Pierse, Perse), persisted in alternating generations across five generations (c1600 – c1710) in this branch of the family. Both names then disappear, and are not known to have returned in use until the 20th century. (2) Within the 14th and 15th century manuscripts included as parts of the “Red Book of Ormond” there are documented many Norman, Wesh, and Irish names. The name Maurice does not appear at all as a forename, and only once in a Latin surname context: FitzMaurice, i.e., “fil. Mauricii”. Recognizing that the ruling family of Ormonde, Butler, was the mortal enemy of the FitzGeralds diminishes the novelty of this data, yet still the information still makes a statement regarding usage of Maurice in Ireland outside of FitzGerald associations. In Irish translations of the Norman “Maurice”, we find the name “Muiris”. This occurs repeatedly in the historical record. A possibility exists that an earlier traditional Irish name also became “Muiris” – that name is not connected to the Norman-Irish families discussed here. (3) Maurice is known to have died at the end of the Desmond Rebellion, in 1584, when his son Eamon, (Piaras’ father) was 16 years old. With Eamon’s birth year understood to be 1568, our first Maurice probably was born c1530 to c1540. When this Maurice was born, the late Knight of Kerry had also been named Maurice. (4) The Hiberno-Norman families in Munster made a practice of marrying within the local “Old English” community, and within the local Irish communities for property gain, and for security. Family alliances were socially and politically important. 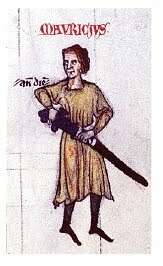 Although the scanty documented history as presently known cannot confirm the names of many wives, we do know that in the mid-1500s the third son of a seated Knight of Kerry (William “McRuddery”) did marry a Ferriter woman. (5) The known dates associated with “The Ferriter” Maurice, and those of William McRuddery indicate the possibility that this lady was Maurice Ferriter’s sister. Given Maurice’s standing as family chief, and the likelihood that the seated Knight would be seeking family alliances, if Maurice had a sister, she would have been the candidate for marriage into the knight’s family. If McRuddery’s wife was not Maurice’s sister, she was very certainly his close blood relation. (6) Born during the years 1645 – 1650, Maurice was likely to have been a married man during the property transactions of 1684, a junior officer in his prime during the Jacobite Wars of 1688 to 1691, and a high profile (by name) papist as the Penal Laws came into effect at the close of the 17th century. (7) The likelihood that Piaras had a second wife, and that she was of the Moriarty family is almost conclusive. Piaras is referred to in the Runincinni Commentaries as being the brother-in-law of Thadeus Moriarty, the Prior of Tralee (also executed in 1653), and in at least one source as being the son-in-law of Dermot Moriarty (Dermot O’Dingle) who was a Moriarty Family chief of the time. (8) In addition, the name Maurice would commemorate not just his grandfather, but the late Maurice FitzGerald, the Knight of Kerry’s brother in whose memory Piaras had written a “caoine” (keen) that has been one of his most enduring pieces of poetry. Similarly, the name provides a connection to Maurice FitzGerald of the Desmond FitzGeralds, uncle of the last Earl, father of James FitzMaurice the great hero of the Munster Catholics during his grandfather’s time. All of these things are concrete contributing reasons for Piaras to use this name for his son. (9) Piaras’ eldest son, (Dominick), and his heirs were moving in the direction of establishing English credentials, a process that eventually led these people into accepting Protestantism, and into a struggle to maintain status as gentry. This branch of the family became extinct in the male line by 1865. (10) Tradition alone – as discussed, there are no direct documentary evidences. There are other Ferriter males in the historical record who are in the line of Dominick, and one other who may have been Maurice’s brother. Given the known rarity of the Ferriter name during the post-Elizabethan era, (Piaras quite possibly was the sole inheritor of the name at that time), that Maurice was Piaras’ son seems likely. There are no documentary evidences of any other Ferriter male of this period producing offspring. Similarly, with Dominick’s offspring well documented, other Ferriters emerging during this period are likely to have been of the line of Maurice. (11) Based upon the earliest birthdates on the Feiritear chart (1808, 1809, 1811, occurring in the 5th generation), and using a 30 year (+/- 10y) generational span, Lucas would have been born c1680 –c1700, which fits correctly with what is known about Maurice, who would have been born just prior to 1650). (12) The name Lucas was also used by each of these men in naming sons, which is very strong evidence that they were Lucas’s sons, as well as Maurice’s grandsons. (13) While this essay may not be considered conclusive, the arguments presented in support of the possibility that Maurice was Piaras’ son are persuasive. The name Maurice was not just a random selection or even simply a tie to the past or a link to lineage, but was a symbol of the choice of constancy with tradition, faith, and heritage. Maurice is an honorable name, and an honor bestowed upon those who bear it. For us, the name continues to include all of the history, plus the additional merit of long usage within the family – the memory of all those who have borne this name before. Finally, for those interested in such things, the name Maurice becomes another item of evidence to use in closing a gap in the Ferriter Family narrative.